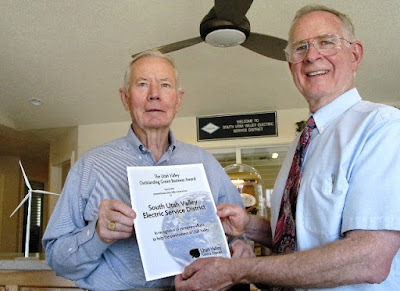 To help mark Earth Day 2009 and to recognize and encourage good earth stewardship, the Utah Valley Sierra Forum (UVSF) Tuesday (4/21) presented its first "Utah Valley Outstanding Green Business Award" to the South Utah Valley Electric Service District (SESD). The UVSF intends to present this award quarterly in the future and invites business and individuals in Utah Valley to nominate green practicing business in the Valley for consideration of this award. Send nominations to uvsf@uvsf.us.